With the include instructions and tutorial DVD, you can learn how to master the Fushigi, mesmerize the mind, confuse the senses, and blow away your friends with cool tricks in no time. With this current offer you can order the Fushigi Magic Gravity Ball for just $19.99 plus the cost of shipping and handling. A free Instructional DVD that is valued at $40 is included inside. 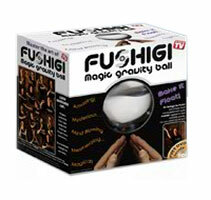 It shows you the basics of using the Fushigi Ball and has step by step instructions on how to perform the cool tricks. 36 Comments on "Fushigi Ball"
The appearance of a floating ball is an illusion that’s been around for at least 20 years, thus the “magic” angle to this product. The balls are made of acrylic, a very hard plastic, and appear to float like bubbles if you put in the time and effort. From what I understand, Michael Moschen was the first to pioneer the use of these acrylic balls which the Fushigi marketers have decided to call their own, while also laying claim to the art form that has existed for decades, and in some cases, even hundreds of years. You can find a wealth of information on the balls sold by Fushigi by doing a web search for “contact balls”, “acrylic balls” and “contact juggling”. If you want to know more about this art form, this is an easy way to connect with the vast community that has formed over the past 15 years. You control the Fushigi ball with your hands. There is no real magic in it.However it is quite amazing to see it.You can learn the tricks for using Fushigi ball by doing youtube search,and again it is very lovely to watch. can you buy this in a store? The first time I saw this was in the David Bowie movie Labyrinth.. I might have been 7 years old. Great marketing ploy, but as said, it’s been around for quite a while. I actually think the ball is kinda nifty….anything to capture the eye and keep a bunch of rowdy kids quiet works for me…tru story the ball is an old gimmick but all the folks sayin it’s nothin extraordinary didn’t come up with the idea to bring it out of the movie and to the mainstream for all to enjoy.. so don’t hate. congratulate and appreciate. looks real cool, Can’t wait to get it. wow i wish i had a fushigi ball……..
im 18 and i love this product. Its amazing idoesnt float but it is a levitation technic which confuses the mind and the eyes. i want the fushigi ball so bad! can you get it in stores? i want a fushigi ball so very bad!!!!!!!!!!!!!!!!!!!!!!!!!!!!! I’m dying to get one!!!!!! When are they available in stores? Will they be available in stores? I love Fushigi i want it really bad iv got to have this gravity ball right know!!!!!! if any body knows me im on facebook!!!!!!!!!!!!!!! It takes a little time to learn and master the fushigi, but once you do you can pull off some cool tricks. can you buy the fushigi ball in stores? Not in stores yet. Only on website or off tv from what I have found out. the Labyrinth baby. they should have called it the bowie ball. dance magic dance…. Its actually not that hard to learn. I had it for 2 days and I’m already getting the hang of it and can do quite a lot of the tricks. Does any one know if there is any difference between the normal fushigi and the glow in the dark one besides the appearance. Like can you still do the same tricks with both? And if it is worth the extra $10? This is definitely my new addiction! I had never heard of contact juggling until I saw a commercial for this a while back. I picked up one recently and I seriously can’t put it down. I’m starting to get better at the moves they show in the DVD you get when you buy it. My friends are constantly using it at my house when they come over too. Overall, lots of fun and a great way to relax! The Fushigi is definitely awesome. After watching the DVD I can do lots of tricks already. Bought one at Target yesterday, as a birthday present for my grandson, hope he likes it. I just bought a fushigi ball at an auction. It does not have the DVD. The box says I can get a DVD free. Could you help me Please.